I'm not sure you want these particular detectives on the case. Who Done It? (1942) is a fun vehicle for Bud and Lou. They are soda jerks working at a counter in the lobby of a building that includes a radio studio. That studio's most popular show is Murder at Midnight and the boys want nothing more than to sell their own mystery scripts. By the way, a real show titled Murder at Midnight was syndicated four years after Who Done It? was released. Using the same name was probably a coincidence, but the possibility the producers of the real-life show lifted the title from an Abbott and Costello movie is an entertaining notion. 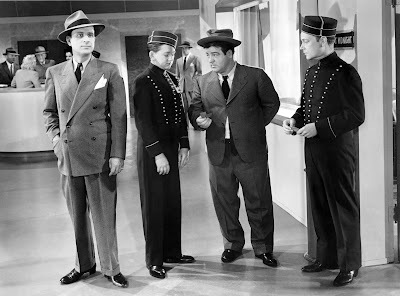 When Lou isn't getting swindled out of nickles and dimes by a fast-talking bellboy, the boys are able to get into the studio one evening to watch while the show airs. But the fake radio murder is interrupted by a real-life murder. Well, if you want to break into radio as mystery writers, what's the best way to go about it? Obviously, its to impersonate real detectives and solve a actual murder. What could possibly go wrong? This is Bud's idea. Gee whiz, people consider Lou to be the dumb one. As is the case with many of their films, there are a man and woman side characters who are available to fall in love with one another and, in this case, actually figure out who the murderer actually is. 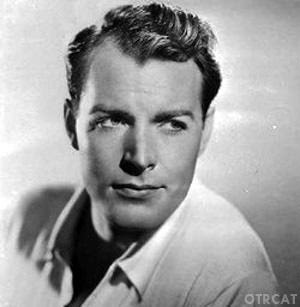 Patric Knowles is a writer and Louise Allbritton is the show's producer. 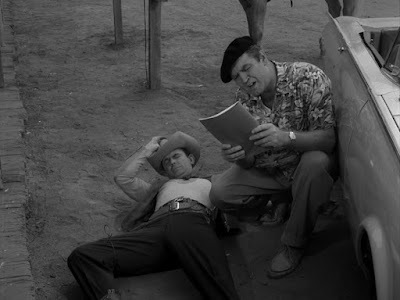 While the cops spend most of their time chasing Bud and Lou around the building, these two do some real investigating and come up with a plan that invovles recreating the radio broadcast to flush out the real killer. This, in turn, leads to a wonderful slapstick scene in which the boys and the killer stalk one another on the roof of the building. 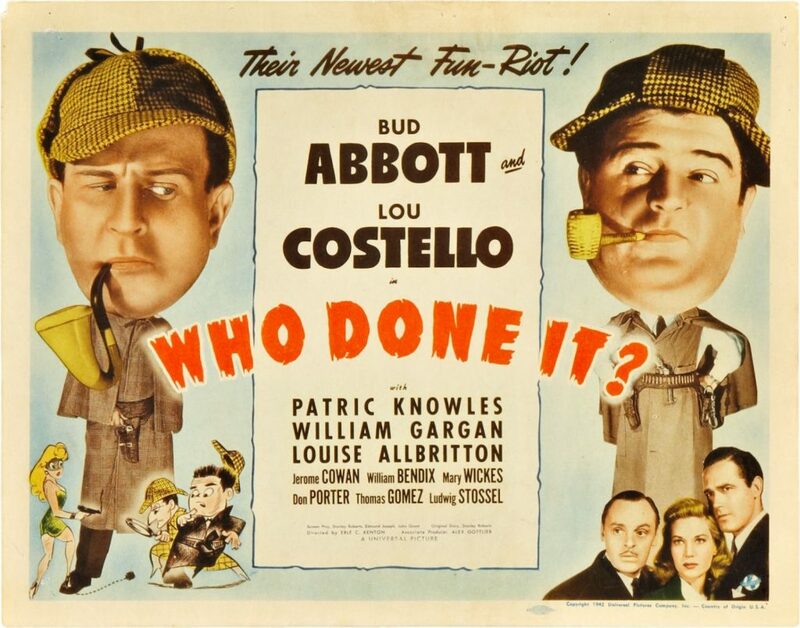 Bud and Lou get great support from Mary Wickes, playing her usual acerbic character with her usual skill, and William Bendix as the world's dumbest cop. Later Bud and Lou films would combine the Universal Monsters with comedy and do this brilliantly. Who Done It? is one of several films in which they show themselves to be equally skilled in combining comedy with murder. 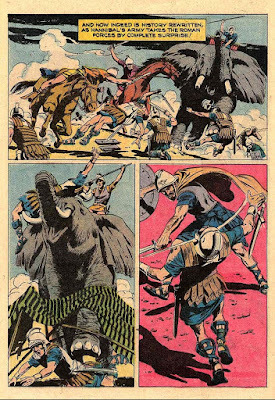 Joe Kubert cover from 1963. Comic book covers often use over-the-top imagery, but I help in the nursery at my church and can testify that this sort of thing happens all the time. The Army of the Potomac and the Army of Northern Virginia met in battle again and again throughout 1962. It was the battle of Chancellorville, fought from April 30 through May 6, that provided the setting for Stephan Crane’s classic novel about a young soldier who struggles to find the courage to fight. The University Theater adaptation is excellent, featuring a faithful script and many of radio’s finest character actors (such as John Dehner and Parley Baer) as it brings the novel to life. This is the seventh of 17 episodes from various series that will take us through the Civil War and its immediate post-war legacy. I'll be posting another Civil War episode every three or four weeks. "Return of a Legend," by Raymond Z. Gallun (Planet Stories, March 1952) succeeds on two levels. First, it's a truly suspenseful tale about exploration and survival on a harsh planet. Second, it creates a vivid atmosphere that really makes you believe in this version of Mars. It's a planet on which an ancient civilization had wiped itself out through global warfare eons ago; a planet where a human away from their colony can survive by literally prospecting for oxygen trapped in plants or in small domes constructed by Martain insects; a planet where food and water can be found with only the greatest effort. The action starts at an Earth colony named Port Laribee, but soon moves out into the harsh Martian desert as a father and his young son move out into that wilderness. The father's mummified corpse is eventually found, but the child manages to adapt and survive. When he's found and brought back to the colony, he soon runs away again. The couple searching for the boy are soon too far from Laribee to get back themselves. With their radio out, they too have to survive in a harsh environment not meant for humans. But they do survive and the story explores the idea of humans adapting to another planet to the point where they might now be considered more Martian than human. The challenge of taming this almost-dead world becomes their driving force. From their lengthening jaunts they brought back the usual relics--golden ornaments, carvings, bits of apparatus that had not weathered away. And the usual photographs of blue-green thickets, war-melted cities, domes celled by honeycombs, suggesting a larval stage in the life-cycle of the ancients, and of country littered with shattered crystal--much Martian land had once been roofed with clear quartz, against the harshening environment. This issue of Planet Stories is available online HERE, so treat yourself to reading this excellent short story. 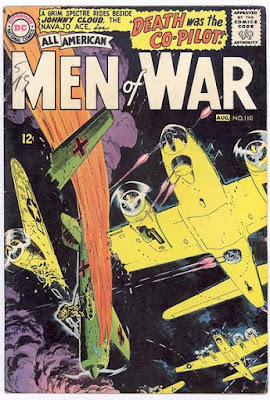 By 1964, DC Comics had established a growing cast of World War II-themed characters, fighting in both the European and Pacific theaters. But, oddly, team-ups between these characters had been rare. So, when Brave and the Bold #52 (Feb-March 1964) decided to have the European-based characters team-up in a single story, it was a bit of a big deal. These characters included a fighter pilot, a tank commander, an infantry sergeant and a French Resistance fighter. Getting two of them together into a single story would probably be pretty easy. But putting all for of them in the same tale would be a challenge. 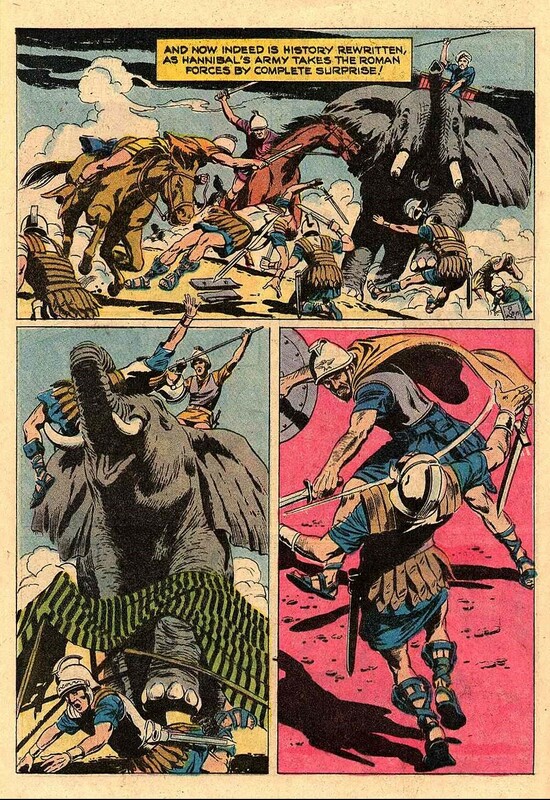 Fortunately for all of us with good taste in our graphic literature, writer Bob Kanigher and artist Joe Kubert proved to be up to that challenge. "Suicide Mission" gradually brings all the various characters in a way that makes sense in context to DC Comics' unique WWII universe. It begins with P-51 pilot Johnny Cloud being given the mission of rescuing an Underground agent named Martin and bringing him back to Allied lines. The mission is extremely dangerous because every German this side of Berlin is looking for Martin, but the agent has information that can save thousands of Allied lives. But the mission starts to go awry from the start. Johnny arrives at the rendezvous only to find most of Martin's Underground team dead or dying. Martin himself is hidden in a hay wagon, encased in a metal suit. The Nazis had captured him and figured a heavy metal suit would hamper any escape or rescue attempts. Well, Martin might currently weigh a ton, but Johnny manages to jam him into his plane. They are able to make a getaway only because the last of the Underground soldiers sacrifices himself for them. This, in fact, will be an ongoing theme throughout the story. 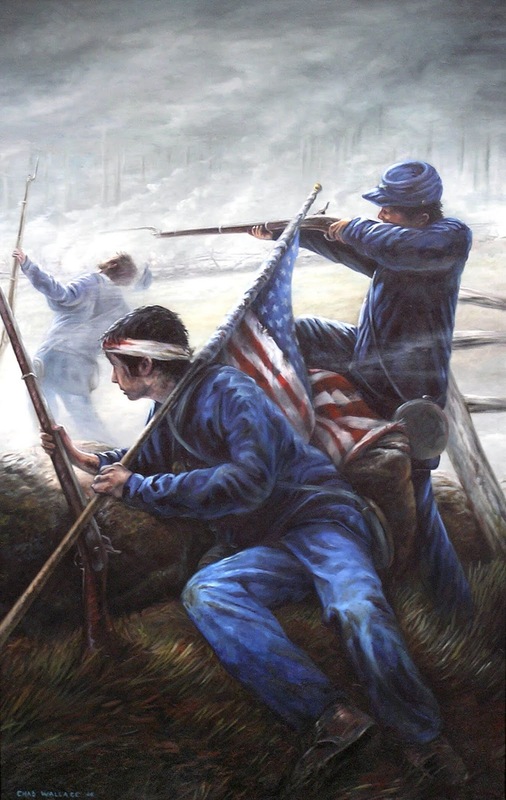 On several occasions, men will give their lives to save their comrades and allow the mission to go forward. It's an effective bit of writing on Kanigher's part, setting up the tense ending when each of the major characters expresses a willingness to die for the others. Back to the story. Cloud's plane is damaged in a dogfight and forced to crash land. Fortunately, Jeb Stuart's Haunted Tank is nearby, though circumstances separate most of the crew from the tank. Jeb has to make do with Johnny, who isn't trained to operate a tank, to help navigate the vehicle and its valuable passenger home. This is another story detail that I enjoy. Johnny tries to drive the tank, but he's pretty hopeless at it. It's something he's simply not trained to do. Finally, Jeb takes over driving and firing the gun while Johnny calls out directions. The ghost of General Stuart shows up to tell Jeb he needs to find a "Rock of Strength" to complete the mission. Jeb has no idea what the general means, but few readers would have missed the pretty obvious reference to Sgt. Rock. Rock does soon show up. When the four other men in his patrol get killed, he uses a bazooka to take out a Tiger Tank and save Jeb, Johnny and Martin. But the Haunted Tank has lost a tread, so now the good guys are on foot. But at least they have time to pry Martin out of his iron suit. And they soon find that Martin isn't a "him," but a "her." The Underground agent they've been rescuing is Mlle. Marie. Marie didn't get on the cover, so there's a fair chance that original readers of this comic didn't tumble to her identity before the dramatic reveal. But, by golly, I knew who she was all the time. The climax of the story has all four protagonists claiming to be Martin after they get captured by a German tank. This is the culmination of the theme of self-sacrifice that's been running through the entire story. Soldiers look out of each other and, if necessary, are often willing to die for each other. No dying is required today, though. Well, at least no Allied dying. When Rock is able to take out the tank by the clever application of two bazooka rockets to the treads, it seems likely that a few Germans died. There's a short epilogue in which the three Americans are each promoted and Rock immediately starts planning for a way to get himself busted down to sergeant again. Rock does not want to be an officer. He works for a living, by golly! That's it for now. Next week, we'll look at the last Lee Hunter/Reb Stuart tale. From 1965. 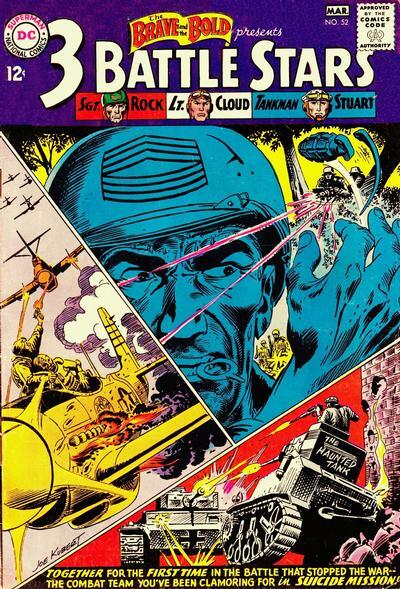 Yet another fantastic Russ Heath cover. A passenger ship arrives in New York. One of the female passengers is poisoned and mystery writer Barton Drake discovers that several other women were also killed on the trip over from Europe. Who is killing these women and what is the motive? So far, the February 1949 issue of New Sports Magazine has given us stories about boxing, football and golf. Next, we get to a story about the only sport that really matters--baseball. "Double or Nothing Guy," by Bob Reed is about Horace Brady, who has just signed on to play second base for the Hawks. Horace has been hitting and fielding well, but the manager tells him he's being sent to the minors after the upcoming series with their arch rivals--the Blues. Why? Because Horace is a well-spoken, educated man who simply doesn't gel with his rough "gashouse guys" who make up the rest of the team. It seems on the Hawks, nobody likes a nice guy. Horace is disappointed, but he still loves the game. That evening, he overhears a conversation between a gambler and the team's ace pitcher Showboat Blane. Blane owes the gambler three grand and won't have the money to pay off for a week. When the gambler suggests there's a way to get the debt forgiven--something that would involve "just one game," Horace realizes the pitcher is being pressured into throwing the big game. So he steps in and offers to loan Blane the needed cash. That decision starts to earn him some respect on the team. But what eventually wins the others over is his play on the field the next day. The rival team seems to be made up of nothing but jerks, who spike infielders when sliding and use brush-back pitches quite often. Horace is pretty even-tempered, but he's soon had enough. He scores a run by barreling through a catcher who tried to block the plate, knocking the catcher out. He also tags out a runner who kept trying to spike him--knocking out a few teeth with the tag as well. The Hawks win the game, Horace will stay with the team, and the story ends on a hilarious twist when Horace learns what the gambler actually meant when he talked about "just one game." I won't spoil that. The story is available online HERE. It's a fun and well-written story, though the moral that you have to play rough to retaliate against rough opponents isn't one I care for. But, to be fair, the umps weren't calling anyone out for the rough stuff, so maybe that's just the way the Hawks had to play. Accept the story for what it is and you'll have a good time reading it. Lee Hunter and Reb Stuart returned to the pages of Four Color in issue #904 (May 1958)--a tad more than a year after their premiere adventures. I assume that means their first appearance had gotten strong enough sales and/or favorable reader response to justify a sequel. 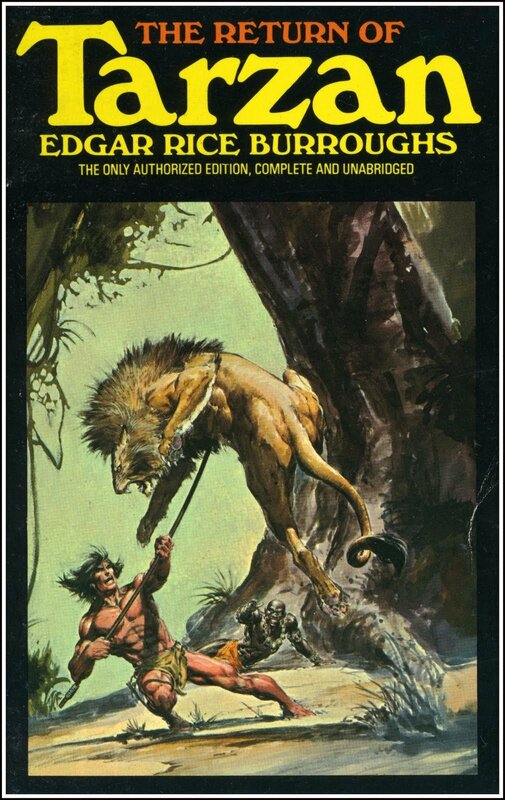 But, unlike other original Western titles such as Ben Bowie or Indian Chief, Lee never spun off into his own book. Did sales slump with the second FC issue? Was their simply no room on Dell's very busy publication schedule? Whatever the reason for these being the last two Lee Hunter adventures, they are pretty good stories. 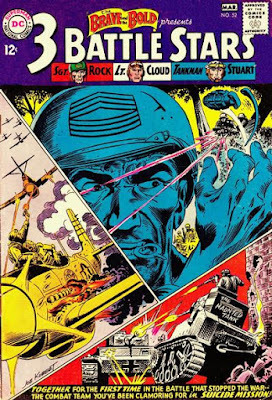 The first is titled "Rebel Glory," which has an uncredited writer and art credited to Ray Bailey in the Grand Comics Database. This one begins with Reb Stuart combining business with pleasure as he travels to a nearby ranch to both buy some horses for the army and woo the rancher's pretty daughter. His romantic interlude is spoiled when some Indians raid the ranch and make off with the horses. Reb reports the theft and soon he and some troopers are off in pursuit, with Lee Hunter scouting for them. Lee and Reb continue to snipe at each other--it seems Lee had an interest in the girl as well--but neither allows their rivalry to get in the way to doing their jobs. Lee decides to wait and Reb decides not to wait. The former Confederate continues to search on his own. He does stampede the horses, forcing the soldiers to work frantically to contain them on Sioux land, but he also finds the horses in the Sioux camp. The Sioux then ambush the soldiers. Lee figures he can force the Indians to retreat by stampeding the buffalo herd they had just worked to hard to keep from stampeding. 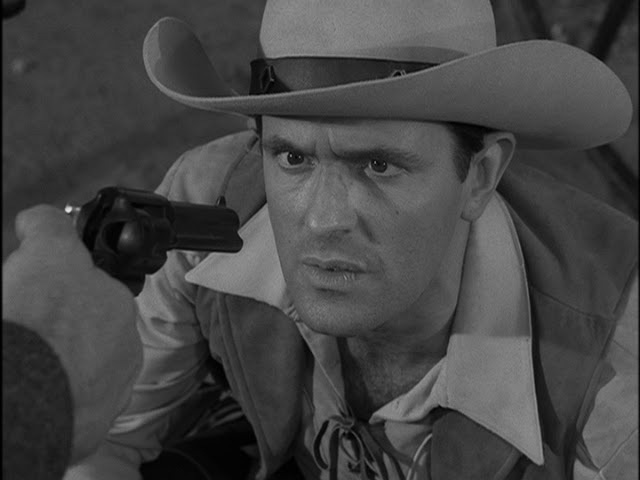 Reb provides a distraction for Lee by breaking out an old Confederate flag and launching a one-man charge. The plan works. 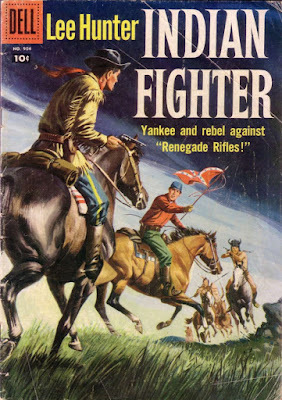 Lee, Reb and the soldiers not only get away with their lives, they also recover the stolen horses. But Lee and Reb still have to have a... "discussion" over who should get to woo the rancher's daughter. This is another good story, though Reb's constant "I'm mad at all Yankees" schtick does start to wear a bit thin. But I do enjoy that the story leaves it open for us to decide about whether Reb was right to keep looking for the horses after it had been decided to stop. On the one hand, he did stampede the buffalo herd just as everyone feared. On the other hand,though, the Sioux did turn out to be the horse thieves, so he was right to be suspicious. 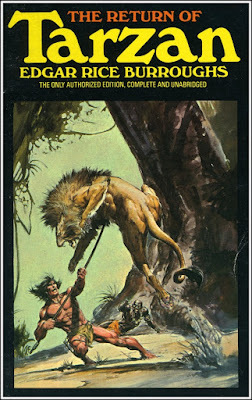 Well, there's one more Lee Hunter story to go before he retreats into Comic Book Limbo. 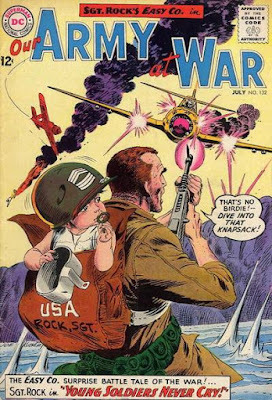 Before we get to that, though, we'll look at an early team-up of DC's World War II characters. Giant robots can be big bullies, can't they? 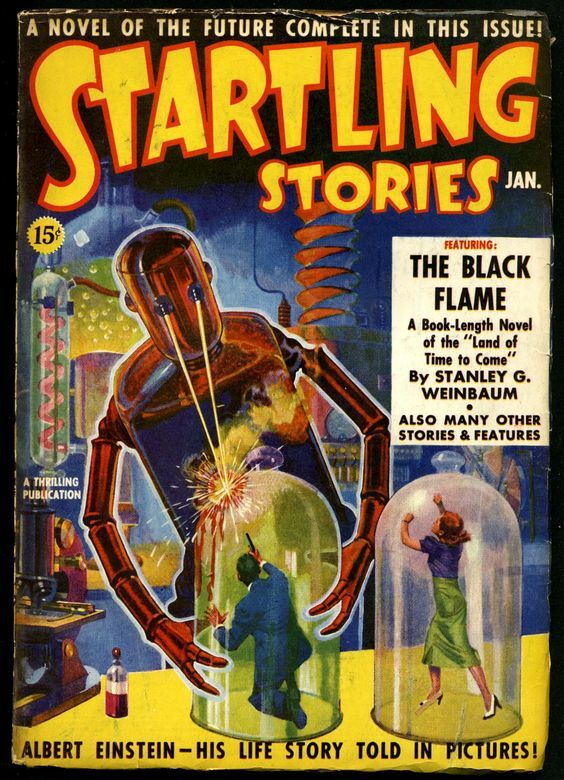 From 1939, with art by Howard V. Brown. 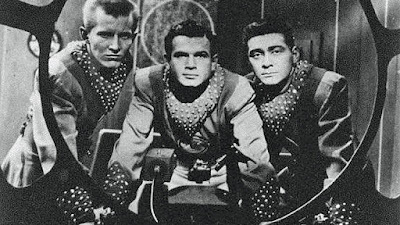 Gold Key's Star Trek comic didn't do many call-backs to elements from specific TV episodes, probably because early on it was being written and drawn by creators who were not necessarily familar with the show. But near the end of that book's run, we did get a sequel of sorts to "The City on The Edge of Forever," in which a temporarily bonkers Dr. McCoy uses an ancient time portal known as the Guardian of Forever to go back in time and change history. 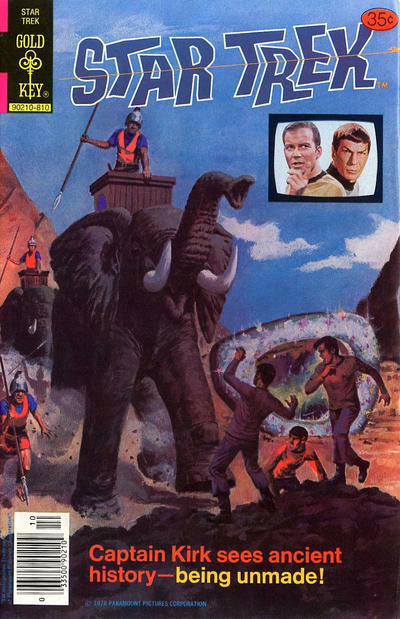 The comic book sequel appeared in Star Trek #56 (October 1978) and is written by George Kashdan and drawn by Aldus McWilliams. This time, it's an insane former dictator named Trengur who uses the Guardian to muck about with history. Trengur had recently escaped from an insane asylum on his home planet and the Enterprise is tasked with finding him. But he makes it to the Guardian and jumps back into Earth's ancient history before he can be stopped. It's not explained why someone not from Earth chooses to muck about with Earth history rather than his own. Also, why doesn't the Federation have a guard or at least a strongly worded DO NOT ENTER sign in front of something that can be used to literally destroy reality as we know it. Both those points are legitimate criticisms of the story, but if you jump past that, "No Time Like the Past" is quite good. Kirk, Spock and McCoy jump back in time after Trengur. They end up in the Alps in 218 BC, when Hannibal invading Italy. They soon find out that Trengor has become Hannibal's advicer and is helping the Carthiginians crush the Romans and prevent the Empire from ever rising. The guys from the Enterprise are unable to stop this. History will be changed. When Kirk and Co. get back to their own time and beam back to the Enterprise, they learn that Trengur had started a chain reaction of historical changes. The plot now mirrors the episode "Mirror, Mirror," with the crew of the Enterprise now evil. The Federation apparently still exists, but the Enterprise belongs to another faction that is planning on destroyng the Guardian of Forever. It's interesting that an early version of the script for "The City on the Edge of Forever" included scenes in which the Enterprise was still around after history changed, but was now crewed by space pirates. I've no idea if the comic story was deliberately lifting ideas from either this or "Mirror, Mirror," but it makes for a fun plot twist. It's a plot twist that also makes Kirk, Spock and McCoy work to earn their pay for the day. Spock suddenly nerve pinches his captain, but this is merely the first step in an improvised con job that would have made the Mission Impossible team proud. Evil Scotty is soon convinced that Kirk has caught an incurable plague. Since Spock and Bones might also be carriers, he forces all three to beam back down to the Guardian's planet, where a planet-destroying bomb is ticking away. That, of course, is exactly where Kirk and his friends want to be. They jump back to 218 BC again, this time getting their a little earlier than they did the first time. They nab Trengur before any history-changing can be done and the day is saved. It is a fun, clever story, with Spock's con job on evil Scotty being a real highlight of the tale. But all the same, somebody has got to tell Star Fleet to restrict access to the Guardian. Maybe a rope strung in front of it? Anything is better than nothing. Next week, we'll visit with Lee Hunter and Reb Stuart for the third of their four stories. 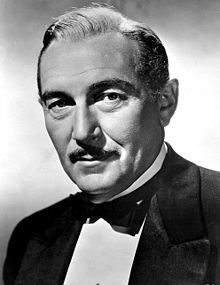 Paul Lukas plays a blind man who is the only "witness" to a murder. Are the audio clues he heard enough to put the finger on the killer? I know that there are people who enjoy playing and/or watching golf. I respect that. I really do. But for me, golf is a sport that was created specifically to be as boring as possible. Aside from the sin shared by all sports other than baseball of not being baseball, it is (as someone other than Mark Twain once said) "a good walk spoiled." But the third story ("Big Drive Guy") in the February 1949 issue of New Sports Magazine is a story about golf and it is actually interesting. Neil Ryan is a successful player who has been invited back to play a game at the swanky club at which he used to work as a caddy. The game is an exhibition match against the club pro and, as we join the action on the 15th tee, Ryan is a stroke behind because he keeps hooking the ball and can't figure out why. Also, his opponent's snooty rich girl friend (whom Ryan has a crush on years before) had earlier invited him over to her place after the game. This is making him wonder if the more down-to-earth girl he's been seeing is really the one for him. The author, Sam Merwin, Jr. was already making a name for himself as a mystery and science fiction writer in 1949, but still found the time to turn out this concise golf story. A good storyteller is, after all, a good storyteller. Merwin brings a fair level of suspense to the play-by-play account of the last few holes in the game and sets up the outcome in such a way to teach the protagonist that he should know he already has a worthwhile lady in his life. "Big Drive Guy" is only six pages long, but Merwin manages to give us a satisfying plot and character arc in the space of those few pages. So for a brief, impossible moment, the magic of the pulp magazines manages to make golf an interesting game. A good storyteller is indeed a good storyteller. You can read this issue of New Sports Magazine online HERE.